The floof can be your child if you want :'3 I like having families. I know a fox who'd be willing to act as sperm donor. Any other interbreeding restrictions? I know a fox who'd be willing to act as sperm donor. 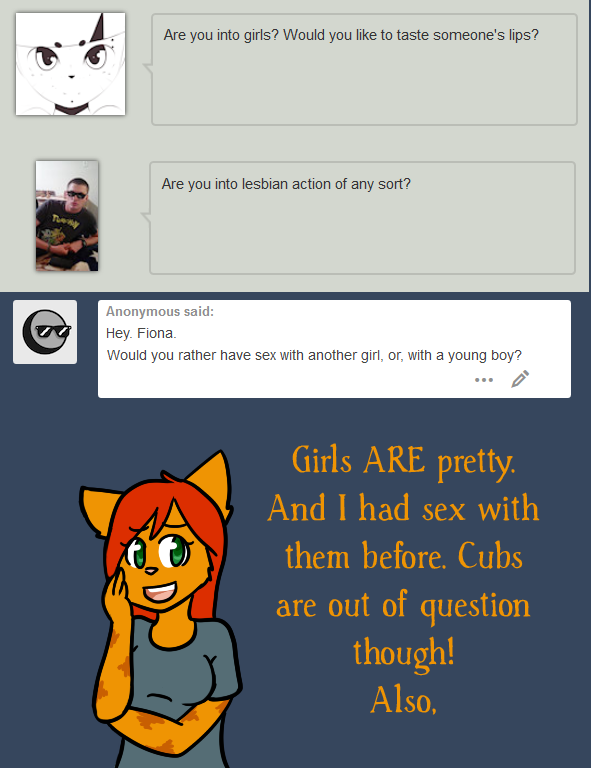 Hey Fiona, A quick question, I've seen you answer alot of questions, what one did you enjoy answering the most and why? LOL. I understand. However in my story, there are a few "limitations". By that I mean that such mixing of the "species", I call them races instead of species, is extremely rare. You'll also note that I said that the cubs of the lion/tigress marriage aren't "hybrids" but mixed race young. This is because the anthros are, in actuality, a created species in which they all have 23 pairs of chromosomes in their DNA, like humans. I call my anthros, humanimals because they are a hybrid of humans and animals. This is why they are capable of creating mixed race young. If only we all had our own universes xP We wouldn't have wars. Where and how did you and Raph meet?